These days, it’s all about offroad caravans. At least, it seems that most manufacturers offer an ‘offroader’ in their stable of vans. Avida joined the offroad gang last year with the release of the Rock. The first model was a 20-footer that could be purchased with two or three bunks as well as a front east-west bed. With loads of storage, independent suspension, scrub bars and other features for hitting the rough, it seemed to have real potential. Now, we didn’t have the opportunity to tow this van ourselves or test it in genuine offroad conditions, so we can’t comment on those aspects. But there’s nonetheless lots to look at…. The Avida Rock looks the part. It rides on a hot-dipped-galvanised chassis equipped with Cruisemaster XT suspension with Dexter brakes and 16in sports alloy wheels. The scrub rails no-doubt add to the ‘offroad’ ability of the Avida and the underside seemed quite well protected, too. 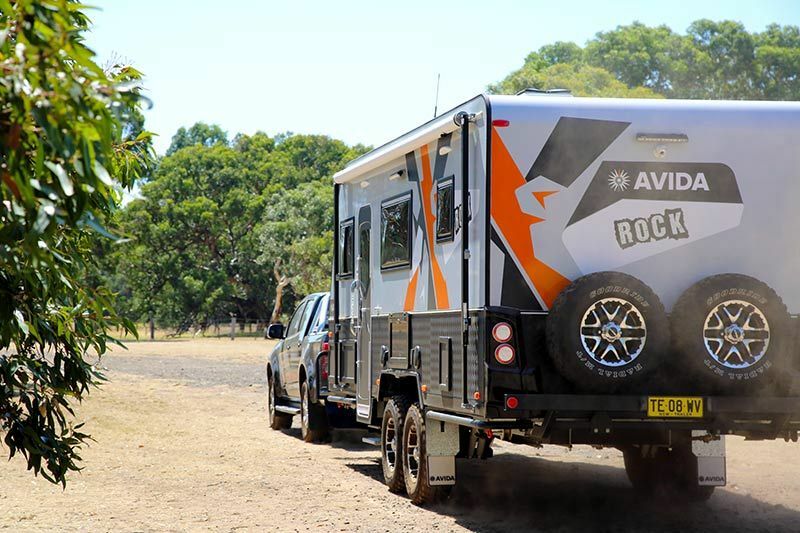 Like other Avidas, the Rock makes good use of fibreglass construction methods, with one-piece walls, a fibreglass composite one-piece floor, and even a one-piece front, rear and roof section. Being an offroader, the Rock gets a high skirt of black checkerplate all around. It does well in terms of external storage, too. There’s a checkerplate storage box on the extended A-frame, complete with a couple of jerry can holders. 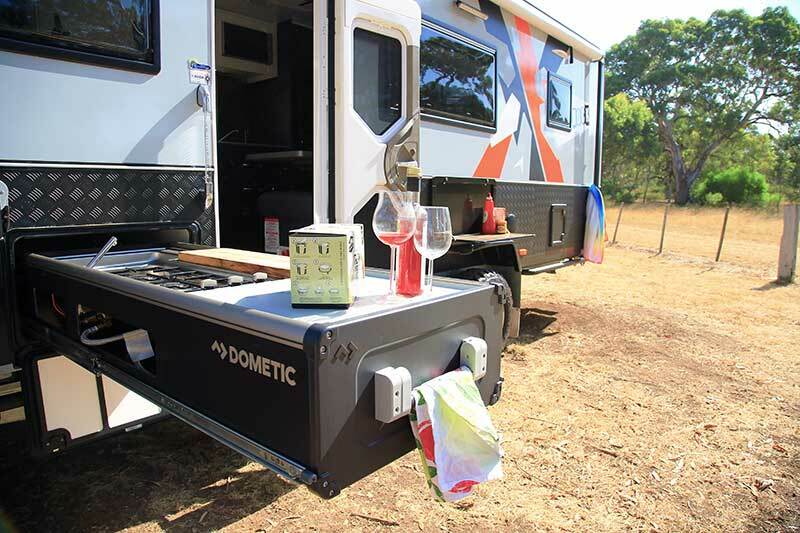 The nearside of the box has a slide-out for a portable fridge, while the offside has one for a generator (portable fridge and generator not included). Two 9kg gas cylinders are fitted in front of the storage box, behind a mesh stoneguard. More storage space can be found in the full-width tunnel boot and in a rather large compartment to the offside-rear. The Rock is a mid to-high end van, and this is reflected in the price. As such, it is fitted with a lot of equipment, including an optional premium external Dometic kitchen. This kitchen slides out from the nearside and includes hot and cold water, a sink, a cooktop, food-prep space, and some storage for utensils, etc. With awning lights, speakers, a reversing camera, a fold-down picnic table and more, the Rock certainly doesn’t feel under-done in terms of features. A quick word on weights, however. At Tare, the Avida Rock weighs 2673kg, while its ATM is 3300kg (though it can be upgraded 3500kg). On the face of it, that’s a payload capacity of 627kg. However, the GTM is 2970kg. The upshot: when loaded to 3300kg, at least 10 per cent of that weight (330kg) has to be supported by the tow vehicle. While striving for a 10 per cent ball weight is, for Australian-built caravans, a rule of thumb, it would be something to be mindful of when loading. When it comes to self-sufficiency, the Rock has genuine promise. Two 120Ah deep-cycle batteries are fitted as standard, along with 300W of solar on the roof – a minimum for any true offroad van, in my opinion. A BMPRO Trek digital display inside the van gives at-a-glance information on the van’s levels, from battery voltage to water – the Rock has a combined 250L worth of fresh water storage capacity (very good), and even a 125L grey water tank. Each water tank appears very well protected, too. For its size, the layout is quite spacious, and I suspect this is due to the east-west orientation of the main bed. The bed is hard up against the front of the van, meaning the inside sleeper will have to climb over their partner for late-night runs to the amenities; however, given the extra living space, it seems like a worthwhile trade-off. Our review Rock looked as though it had already done some genuine miles, including the RV show circuit, as some of the trims inside the cabinets had come loose. Also, inside one of the overhead lockers I spotted two exposed nuts that I guessed were paired to the bolts securing one of the external LED light bars. They were a little unsightly. Our 20ft Avida Rock – officially known as the CV6436 BB2 – came with an L-shaped dinette lounge, though a cafe-style dinette is available, too. The kitchen features the expected items, from sink to cooktop (and griller and optional oven), as well as a microwave that’s recessed into the overhead cabinetry. The fridge is a 190L two-door compressor unit. While kitchen bench space is on the small side, there are loads of cupboards and cabinets – I loved the three large pots and pans drawers, not to mention the soft-close function found on the cupboard doors and drawers throughout. This model is equipped with a rear kids’ bedroom complete with adjacent bathroom in the nearside rear corner. Two or three bunks are available, and each has a niche providing access to the main cupboard, where Avida has fitted 12V points for each child/teenager. Nice. The main rear cupboard provides lots of storage space for the kids and I liked that there’s a false bottom providing service access to the plumbing for the nearby shower. The bathroom is equipped with a washing machine, vanity, cassette toilet and a seperate, fibreglass-moulded shower. It seemed large enough to me but you could always close the kids’ bedroom door for privacy and then use the bedroom to towel off and dress if you find yourself in need of more space. It’s not possible to run through every feature, nook and cranny. Suffice it to say that the Rock doesn’t omit anything and indeed includes all the gear, and more, you’re likely to need for lengthy trips. The Avida Rock requires a substantial tow vehicle – think Jeep Grand Cherokee, Toyota Land Cruiser, et al. This van is not a light weight. But aside from a few small fit and finish issues, which I suspect were the result of the van being ‘used and abused’ prior to my review, the Rock presents well. It certainly promises comfortable and convenient adventures into outback Australia. As mentioned at the start of this review, I didn’t tow the van, but I have spoken to a number of people who have, and each reported a positive towing experience, and I carefully watched from behind, as I followed in my vehicle, as someone else towed our review van and I noticed nothing untoward about its on-road characteristics. If you’re in the market for an offroader with all the trimmings, with a budget of less than $90K, the Avida Rock is worth putting on the must-inspect list.